Here's a great new online slots game from Iron Dog Studio you can play. Do you an inner artist begging to be let out? This bold, quirky and colourful cartoon style slot by Iron Dog Studio is the game for you. It urges you to let colours run wild here with a simple, unique theme as well as colourful bonuses. It’s a 5-reel, 20- line video slot ideal for players looking for an online slot with a bright and bubbly style. You’re going to enjoy the free spins and multipliers of up to 4x. One thing though, Slots Games doesn't provide that insane winning action we’re used to seeing in other Iron Dog Studio releases. Most online slot gaming companies are usually part of a large corporate family and the same goes for Iron Dog Studio. These developers are fairly new in the industry. Iron Dog is based in Hove, England. Their goal is usually to combine state of the art tech with classic gaming concepts. This makes their games a taste of both worlds for players. They have very few games so far, however, they display a great level of skill and effort when designing their games to give them interesting graphics and layout. Each of their games so far is unique in their own and it’s easy to see that they have better and bigger things in store for us. If you love promo's, get the new slot offers online today. The reels fit the game theme perfectly since they are strips of dripping paint. This is a nice change from the usual monochrome reel set up in other slot games. The symbols in this online slot are an artist's props like bottles of paint, paintbrushes and colourful palettes. The game has a bubbly appearance which makes it seem childish. Of course, what makes it different than any other kid’s game is the payouts. 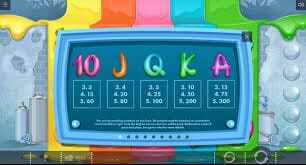 The card symbols A, K, Q, 10 and J can multiply line bets ranging from 3x to 300x. The bottles of paint and paint palette have higher rewards. When you collect 5 continuously, earnings go up to 600x to 2,000x your stake. The least bet is 0.02 and the highest is 100 credits. Both high and low rollers can play for the top jackpot winnings of 10,000 coins. WILD- The wild icon in the game can substitute for all the other icons and form winning combos. FREE SPIN- You can win ten free spins when you fill a side meter with free spin symbols. BONUS ROUND- The bonus round may be the most exciting aspect so far. Here players have a chance of collecting big prizes. The special characters that appear in this round have special rewards for you. One of them is the yellow splat of paint on the reel one that introduces a 1x multiplier, the red splat on reel two adds a 2x multiplier, the blue splat on reel four adds a 3x multiplier and the green splat adds a 4x multiplier. The bonuses come with an extra scatter prize of 25 coins. SCATTER- When you find 3 to 5 scatter symbols, you activate a bonus Balloon game. 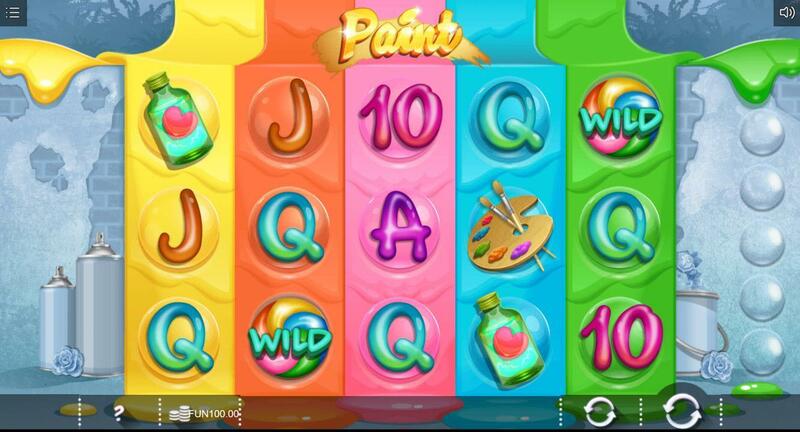 The objective of the bonus game is to shoot the balloons filled with paint and expose special bet multipliers. Paint has a unique and bright theme that may appeal to gamers who love colour or are passionate about art. Other than the bright colours, there’s very little else to be excited about in this game. It’s a bit too simple and feels like it’s meant for children. There are better, more action filled games out there, but this one may not be one of them.